Welcome to the website of Lagotto Romagnolo kennel "Jack of Spades" - Website of jackofspades! Welcome to the website of Lagotto Romagnolo kennel "Jack of Spades"
My name is Catja Jackson and I was born in 1962. In 2010 puppy Elena came into our lives. She is a very lively, sweet natured and affectionate dog and we are very fond of her. The Lagotto Romagnolo has only been recognised as a breed since the early 1990's and in The Netherlands it is still fairly uncommon. We got Elena for a pet and not necessarily for breeding but in case she proved to be suitable with respect to character, health and type, we planned to try to breed a litter with her. Although it is a hobby, we choose a professional approach and I followed a course organised by the Dutch Kennel Club (KKI - Kynological Knowledge I) and got the associated diploma. Also I became a member of the Dutch Lagotto Romagnolo Club (LRCN) and adhere to their breeding regulations. My kennel "Jack of Spades" has been recognised by the Dutch Kennel Club ("Raad van Beheer op Kynologisch Gebied van Nederland"). In 2011 I started an education with the Dutch institute DogVision to become a recognised dog behaviourist/therapist. In May 2016 I received the certificate. As integral part of this education I have been a qualified instructor for dog training since September 2012. 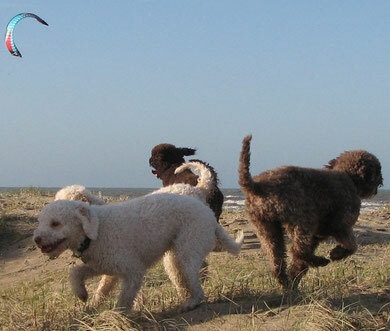 In general the Lagotto Romagnolo is a gentle, sensitive and conflict-avoiding dog. These are of course positive traits for a pet dog. Unfortunately with some individuals in the population these very traits can take the form of extreme timidity, overshyness, reservedness or even fear/fear-agression. With a thorough socialisation there is naturally a lot to gain for such individual. However, there is a significant hereditary component to fear. Therefore I am of the opinion that exclusively dogs with uninhibited and level-headed characters should be used for breeding (particularly in a densely populated country like The Netherlands with a high level of interactions). Healthy parent dogs hold no guarantee for healthy puppies but it is the best thinkable start of a long and happy life for the dog and a minimum of worries and vetbills for the owner. Compared to an open population, a higher level of kinship amongst individuals is inherent to a closed population. In the profession of breeding, mating between close relatives (inbreeding) is often used to anchor desired traits. A risk with such practices (especially in the building-up phase of a breed as in the case of the Lagotto Romagnolo) is that latently present undesired traits are equally anchored. Personally I am of the opinion that with regard to the future it is best to restrict kinship to a minimum and aim for offspring with an inbred coefficient of less than 1%. Good looks come last on my list of priorities. The Lagotto Romagnolo is a naturally pretty dog, not just for its beautiful curls and talking eyes but above all because it is physically such a sound dog. It has a harmonious body of ideal size and proportions combined with functional movements: a feast for the eyes. In short, a father for our puppies needs to have an outstanding character and iron constitution...but for the real Mr. Gorgeous we are prepared to spend a few extra hours in the car if necessary!